iOS 9 is Apple's operating system for its mobile devices that was released in 2015. Ushered in alongside the launch of the iPhone 6S and iPhone 6S Plus, iOS 9 is available as a free download for most modern Apple devices. We've created comprehensive guides that will show you how to download and install iOS 9 onto your iPhone or iPad, and as well as the best tips, tricks and tutorials to show you how to use iOS 9. However, iOS 10 has been released, so if you've upgraded from iOS 9 to the new operating system, check out our essential iOS 10 tips and tricks and our how to use iOS 10 guide. If you've got the recently released iPhone 6S or iPhone 6S Plus then you'll already have iOS 9 installed on your device. If you have an older iPhone or iPad however, upgrading to iOS 9 is easy and – best of all – it's free. If you're ready to upgrade your apple device then check out our step-by-step guide to downloading and installing iOS 9. If you've grown tired of the sweet treats of Android and are making the leap to iOS 9 with a new iPhone, then luckily the switch is pretty straightforward. This is thanks to the Move to iOS app, which can make moving to iOS 9 a pain-free experience. It's still worth getting acquainted with the app, so check out our guide on how to switch from Android to iPhone before you make the jump. Whether you're using just an iPhone, other iOS devices, a Mac or all of these, your Apple ID is your key to the range of online services from Apple and much more. If you want to download and use apps in iOS 9, then it's essential that you have an Apple ID. In our How to create an Apple ID guide we'll explain what an Apple ID is, as well as show you how to create one, as well as additional Apple IDs for the rest of your family. By creating special Apple IDs for your kids you can let them use your iOS 9 device safe in the knowledge that they won't be spending money on apps and games. If you're after more protection for your online data - but don't want to have to remember a host of complicated and unique passwords - then using iOS 9's iCloud Keychain feature can help - as it keeps all of your login details (and more) all under one universal - and secure - Keychain. Check out our how to use iCloud Keychain feature to find out more. Now that you've got iOS 9 installed it's time to see what the new mobile operating system can do. One of the first things you should check out is how to use iPhone widgets in iOS 9, which will make using your iOS device easier than ever before. You should also make sure to check out our iOS 9: tips and tricks feature, which shows you how to tweak iOS 9 to make it run just the way you want it to. At the moment we have 74 brilliant iOS 9 tips and tricks, but we're continuing to add to the guide, so make sure you check back regularly. Regardless of is your new to Apple's devices or a seasoned pro, you're bound to find something new to try out with our guide. iOS 9 has had an update to iOS 9.2, and even if it appears to be a minor update, there are some significant new features. Find out how to make the most of these new additions with our list of iOS 9.2 tips and tricks. The Maps app has been given a huge boost with iOS 9, finally bringing public transit routes that allows you to check the timetables for buses, trains and more. It means you can get directions that include instructions for what public transport to use and where to catch it from. You can also set it to avoid public transport you'd rather not use, such as subways. Check out our guide to iOS 9 Maps to find out more about all the great new features. RIP Newsstand, as iOS 9 brings a brand new News app which allows you to create a personalised newsfeed that will deliver news stories about topics you're interested in. There's a huge range of publications available on the iOS 9 News app, so make sure you don't miss any breaking stories with our guide on using the iOS 9 News app. iOS 9 hasn't just dumped Newsstand for a new app – Apple has done the same with Passbook, which has now been retired in favour of the new Wallet app. 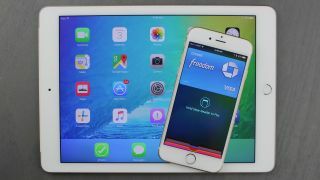 Wallet brings a lot of improved features to iOS 9 that deal with Apple Pay, the new contactless payment method that lets you buy goods and services with your iPhone or Apple Watch. There's a great deal you can do with the app, so make sure you check out our guide on how to use iOS 9 Wallet – it could revolutionise the way you pay for things. Also check out our guide on how to use Apple Wallet from the Lock Screen, which makes using Apple Wallet even more convenient. Of course the Wallet app in iOS 9 is just the beginning of using your Apple device to pay for things. We explain everything you need to know about Apple Pay in our comprehensive guide. Making your very own ringtone for your iPhone not only helps personalise your smartphone, but it also means you can annoy people around you as well if you want to! OK, we don't recommend doing that, but we've got some great tips on using both iOS 9 or Mac OSX to create your very own ringtone that you can use on your iPhone. If you take plenty of photos on your iOS 9 device then you'll want to make sure that they are safely backed up. Apple's iCloud service makes backing up your photos online quick and easy - and you won't have to worry if you accidently lose - or wipe - your iPhone or iPad, as you photos will be completely safe. Check out our guide on how to use your iPhone and iCloud online photo storage to find out more. The fantastic cameras on the iPhone 6S and iPhone 6S Plus, as well as older iPhones, means we're always taking photos on our devices - but that often results in our iPhones telling us that their storage is full. Thankfully there's an easy way to delete all your photos from your iPhone while making sure they are securely saved on your Mac or PC. Once your iPhone is all set up with iOS 9, you'll want to make sure that you have a backup solution in place, so that if the worst happens and your iPhone gets lost or stolen, you can easily retrieve your data. To find out how, check out how to back up your iPhone and iPad for a complete guide on backing up your iOS 9 device. There's little worse than finding you're constantly out of space on your iOS 9 device when you want to install more apps, take more photos or store more music. Our how to free up disk space on an iPhone guide will take you through all the steps to freeing up some much needed disk space on your iPhone or iPad. Want to make your iOS 9 device even more secure? Enable the (relatively) new two-factor authentication feature to add an extra layer of security. We show you how to use this feature, which was introduced in iOS 9, in our how to enable two-factor authentication on your iPhone or iPad tutorial.